Don’t be confused by the title or timing of Alex Hutchinson’s new book, Endure. It’s not about climbing Mount Everest and has no connection to the soon-to-begin Winter Olympics. No, Endure is a running book, above all else, and one of the best I’ve ever read--wide-ranging, thoroughly-researched, informative, and engaging. While it’s got no list of “Top 10 Tips for a Faster Marathon,” you’ll find lots of thought-provoking explorations to motivate your personal challenges. For anyone who doesn’t already know Hutchinson, this is the time to get acquainted. For the last five years, he has been writing evidence-based running articles for Runner’s World, though he recently switched to Outside. Now in his early 40s, Hutchinson spent his 20s obtaining a PhD in physics and a masters degree in journalism while lowering his mile time to 4:01 and representing Canada in international competitions. He’s got cred. 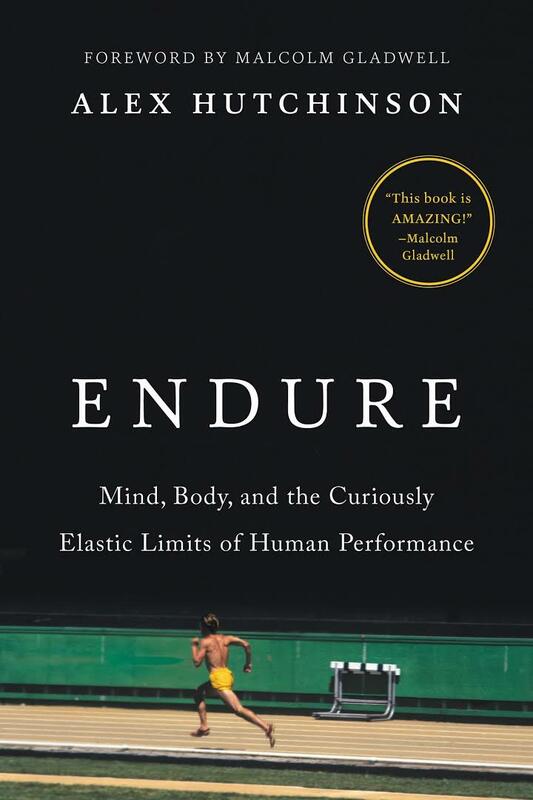 Endure seems a natural successor to David Epstein’s eye-opening The Sports Gene, published in 2013. The difference: Epstein looked at all sports--marathon to sprints to weight lifting to high jump to nordic skiing--while Hutchinson has narrowed his view to just endurance events, including marathons and ultra treks. This micro-focus paradoxically allows him to see more. He investigates the myriad factors--the molecules, if you will--that contribute to great endurance. In the middle of Endure, Hutchinson writes chapters titled “Pain,” “Muscle,” “Oxygen,” “Heat,” “Thirst,” and “Fuel.” These are all subjects that every runner has pondered on one long run or another, and Hutchinson dives deep into each. He reveals history, anecdote, and laboratory results you have probably never encountered before. At least that was true for me, and I’ve read a lot about these things. 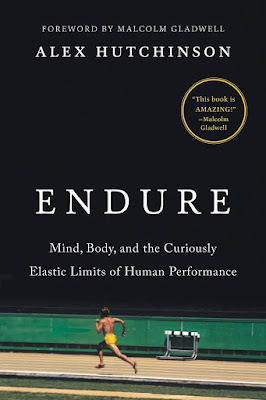 A science-packed tome like Endure, subtitled Mind, Body, and the Curiously Elastic Limits of Human Performance, needs a compelling narrative to keep us turning the pages. Hutchinson stumbled onto the mother lode when he was selected to go behind the scenes of Nike’s Breaking2 adventure. He visits Nike’s inner sanctum months before the actual Breaking2 marathon time trial (May 6, 2017) to discover what a cadre of scientists were thinking and planning for the big event. The goal of Hutchinson’s quest in Endure is new, different, and more interesting than you might expect. He seeks to understand how the brain influences endurance. It doesn’t come easy. I found this--Hutchinson’s self-confessed struggle--the most fascinating part of Endure. When he started the book in 2009, Hutchinson imagined it would be “all about Tim Noakes and how his ideas [the “Central Governor” hypothesis] had upended the conventional body-centric view of endurance.” He soon discovered a similar proposal, the Psychobiology theory of Samuele Marcora. Both posit that the brain limits performance, either to maintain systemic well-being or to follow perceived effort. These new theories shook the very foundation of exercise science, which has always believed that too little oxygen (from the heart), too little glycogen (from foods), and too much muscle fatigue (of the legs) prevented us from running faster and farther. In other words, what we’re talking about here is Brain vs Body--also, new vs old. This stuff can get confusing, but Hutchinson powers on, explicating subtle differences between the Central Governor and Psychobiology perspectives. He likewise reviews other brain-performance links. These include: caffeine, brain-zapping with mini jolts of electricity, swishing but not swallowing sports drinks, Smiley Faces, mindfulness, mantras, visualization, and a range of “belief effects.” You name it, he goes there. I find Hutchinson’s candor rare and refreshing. It also makes me tend to believe other conclusions he reaches in Endure. Finally, it reinforces my personal bias against the whole Brain vs Body conceit. We obviously need both, same as with Nature and Nurture. Besides, Brain and Body aren’t different entities, but a single marvelously integrated machine with infinite feedback loops. I don’t think Hutchinson would disagree about this. And I don’t disagree with him when he implies that many runners have overlooked the mind’s contribution. I know I am one, and he says the same of himself. Alex Hutchinson’s Endure doesn’t present easy solutions or guaranteed results for endurance success. It’s too honest to stray down dark alleyways. Here’s what it does offer: intelligent facts and intelligent analysis of those facts. In particular, it looks at psychology and physiology, and finds both powerful. For sure, none of us will reach our potential if we can’t harness both. And perhaps we have too-often overlooked the Brain. We should remember what the Zen-like Eliud Kipchoge said before running the greatest marathon ever. c Amby Burfoot. Simple theme. Powered by Blogger.